***** Update Winter ’13: This restaurant is now closed. Thank goodness. We went to this restaurant on a group deal Friday night and I feel royally annoyed that I could have spent the evening elsewhere, but at least I suppose it gives me something to moan about on tripadvisor! There are many superb, high end Indian restaurants in Birmingham, sadly this isn’t one of them. The restaurant isn’t massive but when we arrived there was already a large group of about 20 seated inconveniently at the narrowest point of the restaurant. We were seated after five minutes, at a nice enough table, by a surly waiter who had barely grunted at us. We were told two of the signature dishes were off the menu (lamb shank and venison). We ordered poppadoms which arrived a bit soggy, possibly yesterday’s. We also ordered dips to go with the poppadoms. The onion salad, arriving in an egg cup, was a bit stingy for 4 people. We ordered starters and mains, and after a lot of “scuse me’s” we managed to get another drink. Our starters arrived after quite a wait. I had a dish called Malai Milan, sticks of tasty paneer and haloumi lightly spiced with a dressing of capers and onion. It was nice, sadly it was the only thing about the evening that was. My main dish of Malabar Jhinga (King Prawns in sauce) was bland bland bland. I wasn’t expecting spicy because it had a coconut base to the sauce, but it simply tasted sweet, there was no depth of flavour. I also tried my dining companion’s Murgh Makhni promising on the menu a “chicken jambalaya, garlic and kasoori methi flavoured makhni sauce”. The sauce had little flavour other than an astringent lemon juice, certainly no notes of fenugreek (kasoori methi) or garlic. The chicken was well cooked, but the menu shouldn’t use “jambalaya”, because it isn’t one. While we were eating six diners were seated at a table laid for four, including only four chairs. Two of the diners stood for about 15 minutes until some chairs became available. Complete disaster! The staff handled it terribly. All of the diners in the part of the restaurant we were in kept giving each other knowing looks as another pantomime unfolded. Approaching the toilets towards the back of there restaurant, there was a definite whiff of toilet duck, and I was grateful we were seated at the front. The menu has this tag line: “Great chefs are passionate about their food. Forget watching the clock and take the time to understand each individual ingredient, so that you can create and cook something truly wonderful”. Given the amount of time we waited for any food, I can at least attest that they have most definately stopped watching the clock, but given the standard of the food I don’t think they’ve managed the “truly wonderful”. Simply, this restaurant trades off Birmingham’s reputation for having good quality Indian restaurants, and this place does not fit with the likes of Asha’s, Pushkar’s, and Lasan. 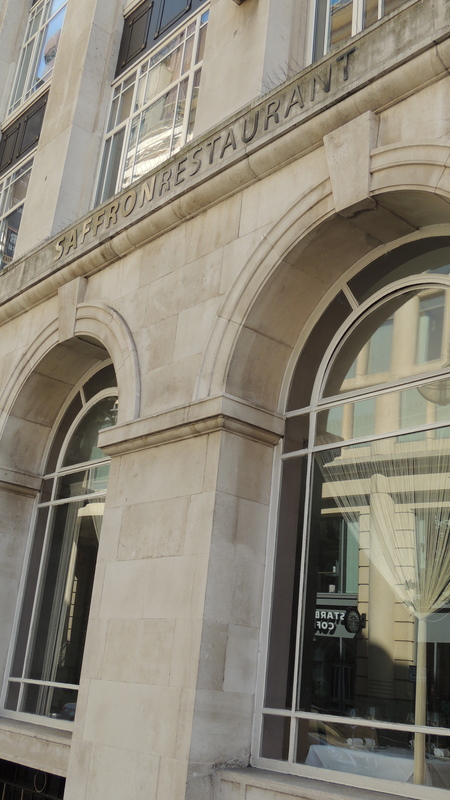 This entry was posted in Area: Colmore Business District, Price: Get your dad to pay - above average, Venue type: Restaurant. Bookmark the permalink. Just catching up with some of your reviews – I also went here on a Groupon deal – trust me you did not miss out on the Lamb Shank – bland does not even begin to describe it. Have to say though the service for us was excellent.